Geography as a subject is in decline and needs to be made more relevant with a greater focus on global issues, England's schools inspectors have said. Climate change, sustainable development and trade disputes could all be studied to increase interest, Ofsted said. Its report, based on inspections and surveys between 2004 and 2007, said geography was the worst-taught subject and that pupils saw it as "boring." The government said teaching of the subject was being revitalised. The report concluded that growing numbers of pupils were opting to drop the subject after the age of 14, when it is no longer compulsory. It was especially critical of geography teaching at Key Stage 3 (age 11 to 14), saying lessons at this level were too often taken by non-specialists because schools focused more on the GCSE years. Inspectors have called for a shake-up with more fieldwork plus lessons on climate change, trade and the concepts of sustainable living and environmental footprints. 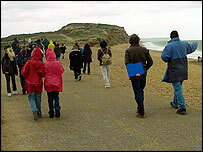 Chief inspector of education Christine Gilbert said: "Geography is at a crucial period in its development. "More needs to be done to make the subject relevant and more engaging for pupils." The report was based on inspections from 2004 and 2005 and from specific surveys of geography in schools between 2004 and 2007. "Recent annual subject reports by Ofsted have highlighted weaknesses in geography in primary and secondary schools and have provided some evidence of decline in the overall quality of provision," the report said. Most primary and secondary schools surveyed did not recognise the value of fieldwork and "did not fulfil the requirement to provide it". Schools were concerned about health and safety, time, expertise and budgets, inspectors found. The report said: "It is important that the citizens of tomorrow understand the management of risk, appreciate diversity, are aware of environmental issues, promote sustainability and respect human rights and social inclusion. "If the aspiration of schools is to create pupils who are active and well-rounded citizens, there is no more relevant subject than geography." Schools Minister Jim Knight said: "Last year we made radical reforms to the geography curriculum to make it more engaging and more relevant to young people's lives - bringing in topics like environmental change and sustainable development, but keeping the essential basics of maps and globes and atlases. "An innovative new GCSE is being piloted that captures the relevance and excitement of contemporary geography. "Geography is an important subject which helps young people analyse, explore and question the world in which we live. We know we need to enthuse young people about geography." The director of the Royal Geographical Society, Dr Rita Gardner, said many of Ofsted's concerns were already being addressed. "Fundamentally, the provision of good geography teaching lies with the teachers themselves," she said. "Whilst there are many examples of good geography teaching, we need non-specialist and the less-motivated specialist teachers to be encouraged to raise their game. "We will do all that we can to support teachers in achieving that." Liberal Democrat children, schools and families spokesman, David Laws, said a lack of specialist teachers and a failure to recognise the value of fieldwork was turning pupils away from the subject. "Geography can be a practical and varied subject, but this report suggests it is at risk of becoming too dry," he said. "Overly bureaucratic health and safety concerns should not be allowed to prevent schools from involving pupils in engaging and interesting fieldwork projects."